Many years ago, my brother penned The Elephant in the Room: Feat Taxes in Pathfinder – an alternate take on feat progression in the Pathfinder RPG. This write-up was surprisingly popular and eventually became the most visited page on this website by a significant margin. It has popped up on Reddit, The Giant in the Playground, and the Paizo forums, and is now used in a multitude of home games across the world. We eventually revisited the ideas presented in the original article and consolidated them into the Hearth & Blade P6 feat tree. This feat tree was a natural evolution for the rule-set, and presents the “taxless” feat system in an easy-to-read format. Although the feat tree was intended to be the final landing spot for the rules, the talented WDMartin from the Lone Wolf Development Forums took things one step further. 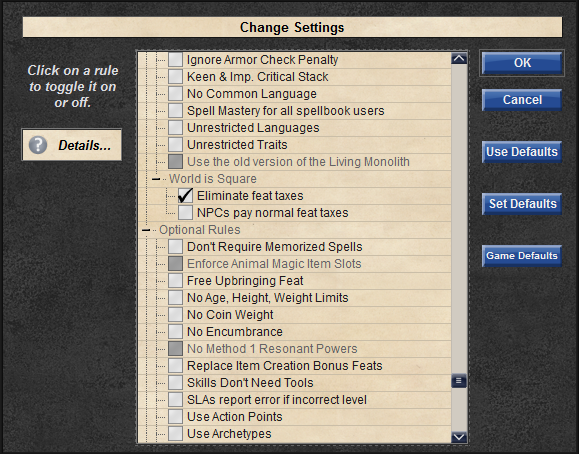 He designed a fully functional mod that allows you to use the feat tax rules in HeroLab! HeroLab is a great character building tool, and seeing our rules integrated into it is just awesome. Installation is simple, and WDMartin has even made a step-by-step guide to get you started. The download is 100% free for current HeroLab users, so go ahead and give a try! If you have any technical notes about the mod, you can comment on the related forum thread. And as always, I’m more than happy to take feedback on the rules themselves. There certainly has been a lot of discussion already. I can’t seem to find a link to add this onto my add-ons. I’ve got the community addons by ShadowChem, but I can’t seem to locate the one for this one. Maybe I’m dumb. Help? I’d suggest getting in touch with WD Martin (http://forums.wolflair.com/member.php?u=60647) if you require further guidance. Thanks! For reference, if anyone else is seeking the answer to my insanely stupid issue, and the issue is my own and not with this site, click on the link underneath the picture that reads “The World is Square House Rules”. Again, I am stupid. I’m noticing that an ACP penalty from shields is being attached to attack rolls when this mod is activated. Is there a reason for that?